Ellen Duysen is a Community Outreach Specialist from the Central States Center for Agricultural Safety and Health (CS-CASH), located at the University of Nebraska Medical Center in Omaha, Nebraska. UMASH and CS-CASH work closely together on outreach activities, particularly at the summer farm shows in the Upper Midwest. 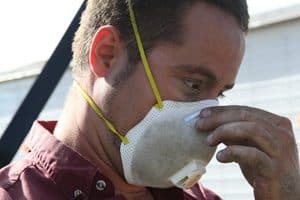 This article discusses dust exposures and the proper use of one type of respirator, also known as a dust mask. Dangerous exposures, such as to chemicals and gases, require the use of different types of respirators and filters. Many respirators require fit-testing by a health care professional to ensure proper fit and complete protection. Always choose a NIOSH approved mask to ensure proper fit and protection. Farming is a dirty job. Farmers may have regular contact with dusts, animals and chemicals leading to an increase in respiratory symptoms such as wheeze, cough and phlegm. Exposure to bacterial agents present in grain and animal dust can result in lung disease including chronic obstructive pulmonary disease (COPD). To address these risks, the outreach team from the Central States Center for Agricultural Safety and Health (CS-CASH) travels to farm shows and agricultural events across a seven states region training farmers on how to reduce exposure to dust and how to properly choose and use filtering face piece respirators (FFR or dust masks). The training team consists of public health professionals, an industrial hygienist and graduate students from the University of Nebraska Medical Center, College of Public Health. Farmers receive training on how to choose the correct dust mask for a particular job, how to get the right fit, and how to care for their mask. Here are some recommendations. Know your hazards. Select a dust mask based on your environment. Dust masks can protect against agricultural dusts and fibers but do not protect against gases, vapors and non-particulate components of fumes, mists, fogs, smoke and sprays. When exposed to non-particulate hazards, specific filters and respirators are needed and fit testing is required. To assist with locating the correct dust mask for agricultural jobs, the AgriSafe Network has developed an Agricultural Respirator Selection Guide. Choose a dust mask that is certified by the National Institute of Occupational Safety and Health (NIOSH). 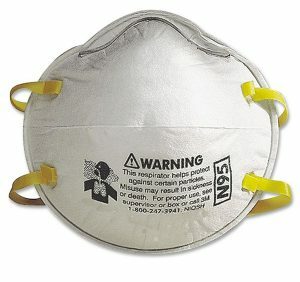 NIOSH certified dust masks will have a NIOSH (N) rating on the mask and will have 2 straps to ensure a proper fit. When used properly, a mask labeled as “N95” removes at least 95% of airborne particles. The N means the mask is not resistant to oil, a mask with an R rating is somewhat resistant to oil, and P rated mask is strongly resistant to oil, or oil proof. Dust masks are available in 95, 99, and 100 efficiency levels. 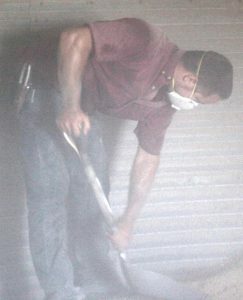 NIOSH provides a guide to approved dust mask models. Choose the right size. Many brands of dust masks come in a one-size fits all format, some may have adjustable straps and nose clips to provide a better fit. A few models are available in large or small sizes for people with larger or smaller than average faces and or nose bridges. You may have to try several different dust masks to get the right fit. Get a good fit. The respirator should fit comfortably on your face, covering most of your nose and all your mouth. The bottom strap should be at the base of your neck and the top strap slightly above your ears. The straps should never be crossed. You need to ensure that you feel the respirator is creating a seal all around. You should perform a user seal check each time you put on your dust mask. Learn how to conduct a user seal check by watching a video created by the Ag Health and Safety Alliance and CS-CASH. Never pinch. When fitting masks with nose clips, never pinch the clip onto the bridge of your nose. This will form a gap, allowing dust to enter at the top of the mask. To fit the nose clip properly, press down on the bridge of your nose and gently form the metal band to the contour of your cheekbones. If your glasses fog up, you do not have a good fit. Dust masks are made to be disposable. Washing or blowing out dust with a compressor will reduce the filtering capacity and will make the mask less effective. Dust masks can be reused if they are only lightly soiled and you cannot smell or taste the dust in your environment. Store the mask in a breathable bag that will allow moisture on the mask to dry and will protect the mask from dust during storage. Put your name on the storage bag to keep track of your mask and to ensure that the mask that you use is your own. Remember to read and follow the manufacturer’s instructions provided with the dust mask. These instructions include information on how to properly use, maintain, and care for the mask, along with warnings on the capabilities and limitations.